The first event was the 400TT and the track was still a little damp, so Louise’s effort was a little off the pace, but this was good enough for 4th place. This was followed by the Scratch race, where the 20 laps saw a fair few attacks to keep everyone on their toes. Two escapees went up the road and Louise didn’t chase, so there was a bunch sprint for 3rd and another 4th place for Louise. The sun was still shining when the Sprint race started and Louise went into this sitting joint 2nd on points, but a 3rd place pushed her down to 3rd overall. And then it happened – it started raining and that was the end of racing! The result stood as it did after just three events, and with no Pursuit or Points race, it was a 3rd for Louise overall. 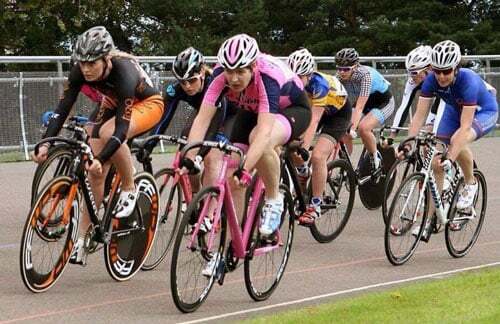 Louise will now turn her attention to preparing to defend her title in the Scratch race at the World Masters Track Championships in the first week of October.